Australia’s resources and agricultural industries are significant components of the country’s strong economy. In particular, minerals and grains are commodities that earn many millions of dollars of export income every year. Iron ore, bauxite, coal and grain are transported by ship to overseas markets, but to get the material to the ship they are all transported at some stage by conveyor belt. A continuous belt is just one of many types of conveyor system. A belt conveyor system consists of two or more pulleys or drums with a loop of a material of some kind — rubber, polyester, wire mesh — that rotates about them. Depending on the length of the conveyor belt, one or more of the pulleys may be powered so that the belt and the material on it move forward. A powered pulley is called a drive pulley, while an unpowered pulley is called an idler pulley. There are two main types of industrial conveyors: those in general material handling, such as ones used to move boxes or components inside a factory, and those used for for bulk material handling, transporting large volumes of resources and agricultural materials such as grain, salt, coal, ore, sand and overburden. The enormous conveyors and their supporting infrastructure represent many millions of dollars of investment by companies over many years, so they need to be protected as much as possible. Massive stresses and strains are placed on the equipment being used when moving many thousands of tonnes of a material every hour along a conveyor belt system. These forces are in constant play at mine sites, bulk handling facilities and shipping terminals, where material is moved from trucks and trains via in-loading circuits to stockpiles and then to ships via out-loading circuits. The longest single-loop belt in the world is associated with a bauxite mine in Western Australia, where a 31 km long continuous belt feeds a separate 20 km belt to transport ore through the Darling Ranges to the Worsley Alumina refinery. This is an unusual conveyor, but bulk handling facilities regularly have long conveyors, especially if there is no deep-water harbour on the coast and loading structures have to be built a long way offshore. As an example, the loading conveyor at Port Hedland in Western Australia is more than 3 km long. Rollers that support, guide and move a conveyor are usually arranged in a shallow ‘V’ configuration so that centre of the belt is lower than the edges, thus reducing the likelihood of material falling from the moving belt. On long conveyors there are often many powered drive pulleys spaced along the belt’s length, interspersed between the many idler pulleys which move material from a loading point to the end of the conveyor. Conveyor capacity is determined by the belt speed, plus the width and angle of the belt. 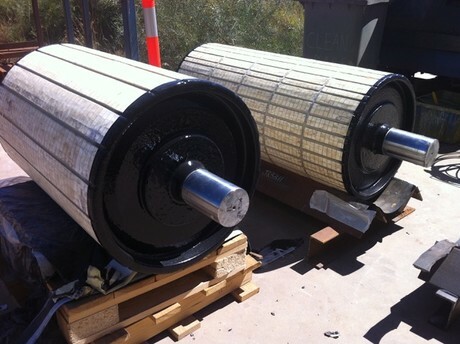 For a mine site or bulk handling facility conveyor, rollers can weigh up to 14 tonnes. Typically, the harsh operating environments of the majority of large bulk handling conveyors play havoc with the rollers, which often need to be replaced every couple of years but sometimes as frequently as every eight months. A common problem affecting industrial conveyors is that dust and small particles bounce off the belt and adhere to the ends of the rollers and coat the bolts attaching the roller to an axle or drive shaft. The bolts can rapidly develop surface cracking, especially if exposed to moisture. One conveyor that exhibited the bolt corrosion problem was situated at a large salt production facility in Western Australia. The highly alkaline environment rapidly corroded the bolts attaching rollers to a drive shaft. Applying Rhino TUFF STUFF — an Australian-made, spray-applied polyurethane — to the pulley ends has largely eliminated bolt failure and therefore greatly increased pulley life expectancy. While initially known for its spray-applied ute tub liner, over the years Rhino Linings Australasia (RLA) has expanded its product capabilities to provide a wide range of industrial spray-applied protective coatings for mining, military, infrastructure, water and wastewater applications. Since its inception in 1988, Rhino Linings’ mission has been to develop, manufacture and distribute top-quality, high-performance polyurethanes, hybrid polyurethanes, pure polyurea and epoxies. RLA’s epoxy division has been specialising in the development of high-performance matrix resins. From its Queensland facilities, RLA is able to provide a streamlined inventory model and prompt shipments to all locations across the Australasian region. Denis Baker, Special Projects Engineer and International Sales at RLA, said that for this trial site he met with the local applicator from Broome at the site, established a remote workshop and coated the securing bolts and complete pulley ends. The customer opted to get the coating done in situ. “Ideally, we would apply the coating to a brand new pulley or roller or as part of a major refurbishment project,” said Baker. “The solution implemented at the salt works yielded enormous life performance improvements with the pulleys still operational after five years. Tears and holes in conveyor belts can also be expensive in terms of lost production and potential damage to associated infrastructure. For some mines and processing plants, this can be hundreds of thousands of dollars per hour. However, according to Baker there are now methods available to repair breaks and tears that can be carried out without too much disruption to operations. In addition to providing a method of coating the retaining bolts, RLA also works with a range of bulk handling facilities to protect and repair the conveyor belts as well. To reduce the cost of downtime, mine companies have opted from time to time to effect patch repairs in the field. A belt is initially blasted with a high-pressure water spray machine to dig into the rubber material of the belt, thereby removing dirt and ‘scarifying’ or profiling the surface. The tear can then be held together with appropriately sized repair staples. The damaged belt can then be primed with the appropriate RLA premium polyurethane primer, followed by filling the tear with Rhino TUFF STUFF. The same material is then spray applied over the filled tear to a reasonable thickness and span consistent with RLA’s application guidelines. The thickness of the coating is dependent upon the product being carried on the conveyor belt and the expected time to the next shut down. Applying a polyurethane coating over repairs and patches to belts extends the service life. The Q300 UHF RFID reader family offers an Ethernet interface and up to four external antennas.